Last night, an interview of President Barack Obama and First Lady Michelle Obama sitting down in the White House with Barbara Walters was aired on ABC. 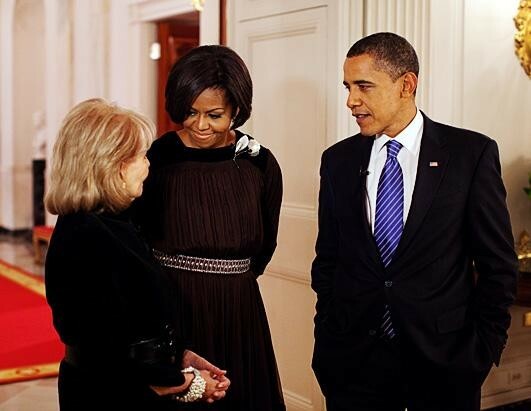 Barbara Walters has been interviewing the First Ladies on the United Sates since former First Lady Pat Nixon. In this joint interview, the first couple was asked about their life in the White House. To view a complete video and transcript for this interview, click here. For this interview, Michelle was dressed in a chocolate colored, pleated chiffon dress adorned with black, velvet trim. She accented this look with an Alex Bittar brooch at the collar and a thick, silver belt at her waistline. What do you think about this look? Do you agree with President Obama, is this “a nice looking dress”? This entry was posted in Michelle Obama, President Barack Obama. Bookmark the permalink. I have been searching all over the web to see a good photo of Mrs. Obama in that chocolate colored dress. I thought the dress was breathtaking and she just looked enchanting in it!! I never tire of looking at her in her beautiful clothes and jewelry. It just makes me feel good to see our President’s wife looking so beautiful for all the world to see. I think she is just captivating in everything that she wears. But more than that it is her caring and compassionate heart that shines through.